Quasars are compact objects located far outside of our galaxy. They are so bright they shine more intensely than 100 galaxies combined, but they are so distant their light takes several billion years to reach Earth. Since the 1960s, astronomers have begun to come closer to the truth about these unusual phenomena in space. The word quasar is a combined form of quasi-stellar radio sources. These objects are so named because they have been observed through radio telescopes. However, only about 10 percent of all quasars emit radio waves. The energy coming from quasars also includes visible light, infrared and ultraviolet radiation, X rays, and possibly even gamma rays. Radio telescope: A telescope that uses radio waves to create images of celestial objects. Radio waves: Longest form of electromagnetic radiation, measuring up to six miles from peak to peak. Redshift: Shift of an object's light spectrum toward the red end of the visible light range—an indication that the object is moving away from the observer. Spectrum: Range of individual wavelengths of radiation produced when light is broken down by the process of spectroscopy. In the early 1960s, American astronomer Allan Sandage photographed an area of the sky and noticed that one star had a very unusual spectrum. (A spectrum is the diagram of individual wavelengths of radiation from a star.) Most stars emit radiation consistent with the spectrum of ionized (electrically charged) hydrogen, the most abundant element on the surface of stars. This star, however, had a spectrum that seemed to reveal none of the elements known to exist in stars. The wavelengths at which it emitted radiation were heavily skewed toward the red-end range of visible light. Such a skewed spectrum is known as redshift and is an indication of an object moving away from the point of observation. The greater the redshift, the faster the object is moving away. And as an object moves farther away, it picks up speed, increasing its redshift. In 1963, Dutch astronomer Maarten Schmidt correctly identified the star's strange spectrum as that of a normal star with a high redshift. His calculations placed it an amazing two billion light-years away. In order to be observable from Earth at that distance, the object could not be a star, but had to be something larger, like a galaxy. Schmidt measured the diameter of the object and learned that although it was emitting as much energy as one trillion suns, it was only about the size of the solar system. The brightest quasar to date, located in the constellation Draco, shines with the light of 1.5 quadrillion suns. Astronomers formally believed that a quasar is found in a particular type of galaxy and is formed during the collision between two distant galaxies. When this happens, one galaxy creates a black hole in the other with the mass of about 100 million suns. (A black hole is a single point of infinite mass and gravity.) Gas, dust, and stars are continually pulled into the black hole. The temperature in the black hole then rises to hundreds of millions of degrees, and the black hole spews out tremendous quantities of radiation. This theory was turned upside down in late 1996 when the Hubble Space Telescope (HST) took pictures of galaxies that are hosts to quasars. 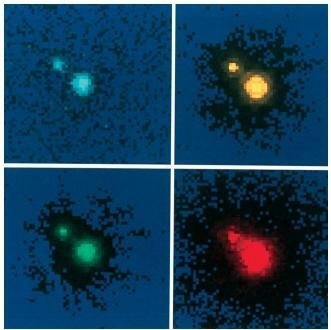 The pictures revealed that there was no pattern to the shapes and sizes of the galaxies. The pictures also showed that while many of the galaxies were colliding with each other as scientists had theorized, almost as many galaxies showed no signs of collision. Quasars are the most distant, fastest, and most luminous large objects known in the universe. Because they are so far away, they give us a glimpse of the early universe. Since a light-year is a measure of the distance light travels in space in one year, viewing an object one billion lightyears away is really like looking one billion years back in time. Some quasars are so distant they are virtually at the edge of time. They are relics from the period following the big bang event that created the universe some 12 to 15 billion years ago. The most distant quasar known was discovered in November 1999 by the National Aeronautics and Space Administration's BATSE (Burst And Transient Source Experiment) satellite. Known by the scientific name 4C 71.07, this quasar appears to be about 11 billion light-years away. We therefore see quasar 4C 70.71 as it existed perhaps as little as a billion years after the big bang. That time period seems long by human standards, but it is near infancy by standards of the universe.